The exchange is starting... The moment is now! Hi guys, this is our first blog post and we are really happy to share our experience as Youth Delegates. We are the current Youth Delegates from Colombia to Norway 2016-2017. Together we want to do a lot of things in Norway. We are Sebastian and Johan Sebastian (JSebastian in our blog), yes two Sebastians. That is so funny when we get to know new people in Norway. Sebastian Giraldo Ramirez, 23 years old, has lived all his life in Risaralda in Pereira. He is studying Industrial Engineering. He has been a Youth Volunteer since 2006, with a background in PACO (Peace, Action and Coexistence). He has also worked with sexual and reproductive health and recreation program. Sebastian is a friendly, funny and talkative guy with a lot of energy. He is always ready for new adventures, challenges and to make new friends. Johan Sebastian, 23 years old, who will be called “JSebastian” in our blog posts, was born in Villavicencio/Meta. Colombia. He studied social communication and journalism. He has been a Volunteer in Colombia for eight years, with a background in PAL (Outdoor Activities Program). He has worked with victims of the internal conflict in Colombia and also in PACO and the School Sector Programme. JSebastian is funny and he is interested to getting to know as many people as we possible can. Together we are the first Youth Delegate from our districts in Colombia, and also we want to be a good team and share our experiences and values with Norwegians. We want to get to know the Norwegian culture, the language and also snow. Yes, we are waiting for the freezing winter. Brrrrrrrr. El intercambio está empezando. iEl momento es ahora! iHola Chicos! Esta es nuestra primera publicación en el blog y estamos realmente felices de compartir nuestra experiencia como Delegados Juveniles. Nosotros somos los actuales Delegados Juveniles de Colombia en Noruega entre el 2016 y 20107. Somos Sebastian y Johan Sebastián (JSebastián en nuestro blog), ¡sí dos Sebastian!. Eso es muy divertido cuando conocemos nuevas personas en Noruega. Sebastian Giraldo Ramirez, 24 años. Sebastian, ha vivido toda su vida en Risaralda-Pereira. Es estudiante de Ingeniera Industrial, ha sido voluntario desde 2006. En la Cruz Roja Colombiana ha participado en los programas PACO (Paz, Acción y Convivencia), también ha trabajo en los programas de Recreación y Salud Sexual y Reproductiva. Sebatian es joven divertido y amigable con mucha energía; siempre está listo para nuevas aventuras, desafíos y hacer nuevos amigos. Johan Sebastián, 23 años de edad. A quien llamaremos “JSebastian” en las publicaciones de nuestro blog. Nació en Villavicencio-Meta, Colombia. JSebastian estudió Comunicación Social –Periodismo. Ha sido Voluntario por ocho años, como Voluntario de la Cruz Roja Colombiana ha participado en los programas Aire Libre (PAL), PACO y Sector Escolar, además ha trabajado con víctimas del conflicto armado colombiano. JSebastian es divertido y está interesado en conocer tantas personas como sea posible. 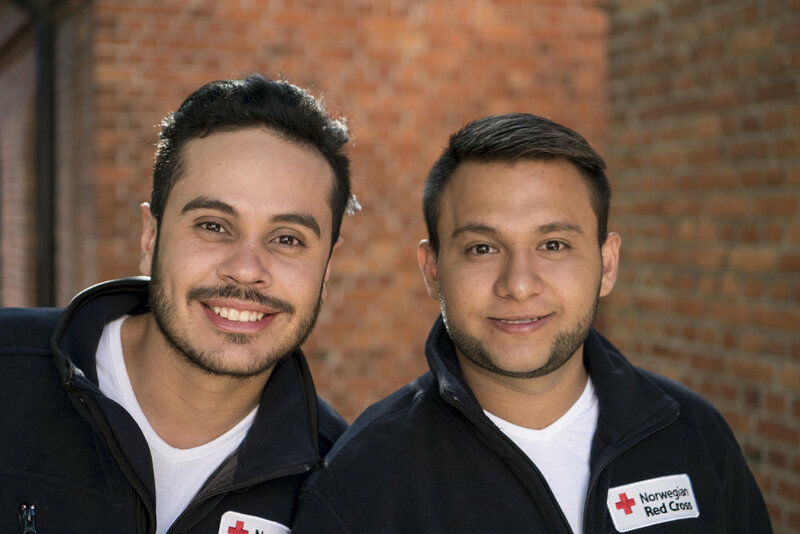 Juntos, somos los primeros Delegados Juveniles de nuestras seccionales en Colombia y además juntos, queremos ser un buen equipo de trabajo para compartir nuestro conocimiento, experiencia y valores con los noruegos. Queremos aprender de la cultura noruega, aprender el idioma y también la nieve. Si, estamos esperando por el frío invierno. Brrrrrr. Newer Post20 days in Norway… Funny stories to tell.